Okan Tower is an ultra-luxury development by Turkish developer and leading enterprise, Okan Group. The 70-story, mixed-use project was designed by architecture firm Behar Font & Partners. 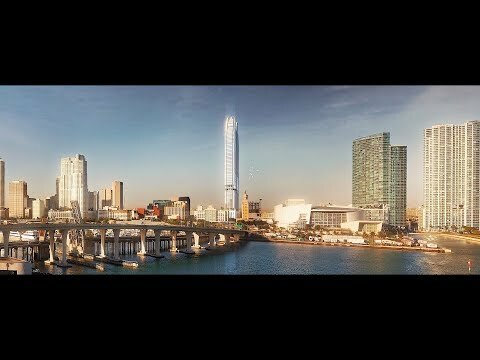 Once completed, Okan Tower will be the tallest skyscraper in Miami, surpassing Panorama Tower by 22 feet (890 feet vs 868 feet). Okan Tower will feature a striking curvature meant to emulate the silhouette of a blossoming tulip (Turkey’s national flower). Located in Downtown Miami, Okan Tower will deliver a 294-key hotel by Hilton Hotels & Resorts, 236 condo-hotel units, 64,000 square feet of ‘Class A’ office space, and 149 condo residences plus four penthouses, with the promise of both sophistication and convenience. The Okan Tower condo-hotel units (from studios to two-bedrooms) will be delivered turnkey furnished and ranging in size from 447 to 1,245 square feet, while the condo-residences will be comprised of one- to three-bedroom units plus a den, ranging in size from 698 to more than 2,071 square feet, plus four duplex-style penthouses ranging in size from 1,873 to over 2,142 square feet. Okan Tower will feature world-class amenities, including: a sky pool located on the 70th floor, outdoor lounge, Hammam spa, state-of-the-art health and fitness center, chef and gastro kitchen, kids’ playroom, movie theater, wine cellar and cigar room, a rooftop restaurant located on the 67th floor, and high-speed elevators with separate access for the various mixed-use components. Okan Tower will be located in Downtown Miami at 555 North Miami Avenue. With Miami Worldcenter, MiamiCentral train station, Perez Art Museum, Frost Museum of Science, and the Adrianne Arsht Center for the Performing Arts all within walking distance, Okan Tower will offer residents and guests convenient access to shopping, entertainment, cultural events, and transportation. Pricing starts at $318,500. Okan Tower is expected to break ground in Fall of 2018 and estimated to be completed in 2022. Catering to the taste of foreign buyers so closely tied to new condo development in Miami, Okan Group opened a 3,000 square-foot sales gallery in Istanbul complete with a full model residence on May 2, 2018.